Homemade Natural Vegan Soaps, handcrafted with the highest quality base oils, essential oils, and botanicals to give you a fine-textured, luxury bar of soap for shower, bath, or kitchen. Beautiful photographic note cards professionally printed on heavy card stock, with a premium fine matte finish, easy to write on. Each card is 5.5 x 4 inches, has a blank interior for your personal message, and comes with a white envelope. Card and envelope are contained together in individual cello sleeves and the entire set of four note cards comes wrapped in a kraft paper band. Be sure to view all the photos above. All note cards are from my own photography. I also do every bit of the creative process involved in creating my photo greeting cards: photography, complete design, layout, assembly, packaging, etc. I was born in Wisconsin and have lived here almost all my life. Many of you have seen my Wisconsin Barns on Instagram - @cranberrymorning. I never tire of photographing our barns, for sadly, some day they will no longer be part of our landscape. They're beautiful and take us to a less complicated time. 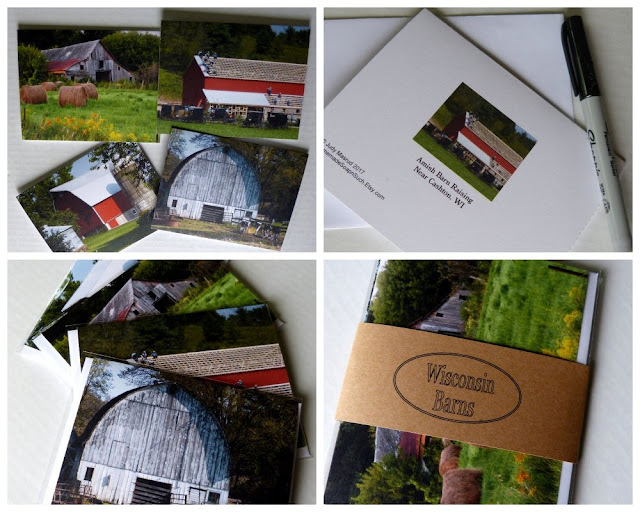 I'm very pleased with these Wisconsin Barns note cards and I hope you will enjoy sharing them in your correspondence. This item is not included in my Buy Five or More, Get One Free offer, which is for my handcrafted, vegan soaps. THIS LISTING is for one set of four premium photograph note cards, 'WISCONSIN BARNS.' It includes Dairy Farm Barron County; Neighbor Bill's Barn in July; Heifers Gathering; and Amish Barn Raising. $11.95 per set of four. All of our HomemadeSoapnSuch luxury bar soaps are made with only the finest quality natural base oils and botanicals. No harsh chemicals, no oxides, and no animal products are used. Only natural colorants are used. As with our bath and body bars, our Jojoba Awapuhi Shampoo Bar contains no parabens or sulfates. Our soaps are gently fragranced with essential oils and/or quality fragrance oils and have a luxurious lather. Once your skin and hair have been treated to the gentle luxury of quality HomemadeSoapnSuch soaps, you will never again want to go back to mass-produced soaps which contain chemicals that can dry and irritate. Because each batch of soap is handmade and hand cut, there may be slight variation of color or size from one batch to another. Each listing is for 1 bar of HomemadeSoapnSuch natural vegan soap. Buy any 5 or more bars, Get 1 FREE. Please type in Free bar choice in message to seller to that it doesn't get tallied with your total. Thank you for visiting HomemadeSoapnSuch. Please check back frequently to see new soaps as they are added to the collection. P.S. International shoppers: International shipping is available at our Etsy Store. Who knew that dissatisfaction with chemical-laden soaps and a desire to try my hand at making something better could lead to this. From raising botanicals in our garden to learning about natural oils and colorants, to creating, trying, and adjusting recipes to bring you the best possible natural and gentle product, I love every part of the process. Owner, dreamer, designer, maker, photograper. I also take care of correspondence, labeling, packaging, shipping, and eating the Ritter dark chocolate with hazelnuts. Shipping within the U.S.A. only. International shipping is available at our Etsy Store (link below). Orders are shipped USPS First Class or USPS Priority Mail depending upon weight. Shipping prices listed above apply to orders shipped to one address. All our new soaps are announced on Cranberry Morning! Are you interested in carrying our handcrafted soaps in your shop? Please email us. Judy(at)soapnsuch(dot)com.